Thanks to reddit user /u/shadowbannedkiwi we now know all the Dino Kibble recipes and thanks to Steam user “ballsymcnutt” we also know what Dino likes what! Discuss this image on reddit! Also new in Patch 186.0: Traps, the Industrial Grill and the Omni Lamp Post. Bro you have a Mistake. It is Fiber not Thatch and Also only 3 Fibers are Required not % Thatch. Heyo, since testing has shown that ptera egg kibbles can also be cooked with usual cooked meat I’m not so sure about the rest of it. Can we get an updated one of these? 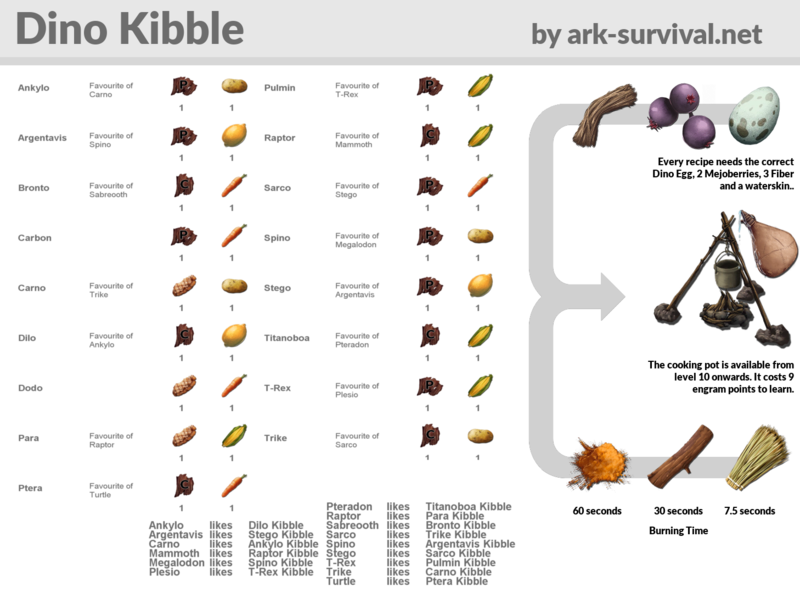 There are a lot of new Dino’s now and I use this to remind me what kibble I need but can’t remember or know what most of the new Dino’s eat kibble wise.